Capoeira Tucson is home to our group Capoeira Mandinga Tucson, founded in 1996 by Anne Pollack (Mestra Luar do Sertão). With over 30 years of experience, she continues to lead, teach and direct our group in Afro-Brazilian capoeira, dance, music techniques, etiquette, history and philosophy. Our Capoeira Mandinga Tucson group is part of the worldwide Capoeira Mandinga group that is directed and guided by Mestre Marcelo Pereira, the third capoeira master to bring capoeira to the United States. Capoeira is a thrilling, expressive Afro-Brazilian art form that is fun for kids, teens and adults. It was started over 450 years ago by Africans enslaved in Brazil as a means to train and fight for freedom. After centuries of oppression, in 2014 capoeira was officially recognized as a UNESCO Intangible Cultural Heritage of Humanity and is the second most popular sport in Brazil. Capoeira combines martial arts, dance, gymnastics and music that includes percussion instruments, rhythms and songs. 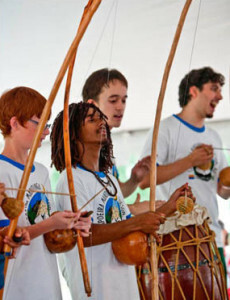 Originally, elements of dance, song and percussion were interwoven into capoeira to disguise training to fight for freedom by making it appear as a game of dance and music. Today, capoeira is a challenge that creates full-body fitness and a path for self-expression. We offer capoeira classes for tykes (ages 3 – 6), kids (ages 6 – 13), teens and adults, honoring the traditions of both capoeira movements and music while encouraging creativity in the capoeira game. We also offer opportunities for all of our students to participate in shows and events, both locally and around the US, that educate the public about the roots, traditions and fun of modern Brazilian and traditional Afro-Brazilian capoeira dance, music and culture. Our group focuses on challenging students physically, mentally and musically in a supportive environment to inspire self-discipline, self-confidence, communication, tolerance, teamwork, fitness, flexibility, endurance and concentration – important life skills that can be continually improved and built upon. Most importantly, we strongly support the efforts of everyone in our capoeira “family” to continually strive to face and conquer new challenges and to explore capoeira and life as a means for self-expression. Capoeira enhances our Tucson community’s understanding and appreciation of Brazilian history and culture and is a remarkable means to bring together people of different cultures, gender, ages and socio-economics. Our Capoeira Mandinga Tucson group emphasizes excellence and honors everyone as an individual who has the potential to help create a better society. Our nonprofit Capoeira Institute Southwest raises funding and strives to create opportunities for underserved kids and families of our Southwestern communities to learn capoeira and take part in shows and events in which we bring internationally respected masters of capoeira and Brazilian cultural arts into communities across the Southwest. Please support the Capoeira Institute Southwest, a nonprofit 501(c)(3).